The combined revenue (estimated, non-audited) of associated companies has grown by 77% during 2017. Loudspring focused on exits in selected holdings and increasing ownership in selected holdings close to profitability. Loudspring carried out three directed share issues during the year bringing the company approximately EUR 5MEUR in total, before expenses related to the fundraisings. Loudspring will, starting this year, also report the combined revenue of the associated companies where the core holding figures are audited. This will be done in a separate release once audited figures have been received from all core holdings. Enersize completed its IPO on Nasdaq First North Stockholm 15th of June 2017. On the first trading day the volume was 3 317 501 Enersize shares traded and the share closed at 8.55 SEK (0.88€), 24% up from the IPO price. Enersize installed its software in 8 factories during the reporting period, six of them in China, two in Europe and received their first recurring order. Renewable energy provider Nocart closed a 14MUSD order for a solar power plant in Kenya and a 200 MUSD solar hybrid power plant in Zambia. Both projects are going forward but Nocart’s delivery for the project in Zambia has been delayed from original schedule, which has caused a lower revenue estimate for Nocart in 2017 than was anticipated in the Loudspring H1/2017 release. Nuuka Solutions (later referred to as “Nuuka”) received new orders from major companies both in Benelux and Sweden and signed its first US customer. Monthly recurring revenue grew by 125% during the year. Swap.com surpassed 2 million items and now has 2.3 million items for sale on Swap.com. Eagle Filters (later referred to as “Eagle”) air filtration solution was after a long testing period approved by the world’s largest provider of electricity from natural gas, Engie, and received its first air filtration order from them as well as several new and repeat orders from other global energy providers. Eagle’s revenues increased by 37% compared to previous year. ResQ Club monthly purchasing users experienced 212% growth compared to previous year. Food sales over ResQ platform in 2017 were approximately 1.5MEUR. Funding risk, mainly in terms of successfully closing financing rounds, has increased for the associated companies as the uncertainty in capital markets has notably increased. Cleantech Invest changed name to Loudspring and announced an intention to gradually go from investor-accelerator into a company group focusing on saving natural resources. Loudspring increased ownership in food-saver ResQ Club from 7.5% to 15.6% (and approximately to 17.8% depending on outcome of current funding round). Loudspring increased ownership in building digitalisation company Nuuka from 39% to 47.9% (non-diluted) through a share swap with some of the founding shareholders. Loudspring increased its ownership in Eagle Filters from 28% to 34%, with an option to increase its ownership further to 40%. In November 2017 Loudspring carried out a directed share issue of 1,2MEUR with 442,250 new class A shares subscribed at the subscription price of EUR 2,64 per share. Loudspring participated in an underwriting consortium to back Swap.com’s investment round, with a 1.5M€ underwriting commitment. This commitment turned to a 1,25MEUR investment into Swap later during H2/2017. Loudspring raised its first debt capital, via a credit line of 1MEUR from Nordea Bank. Eagle Filters signed a repeat order from IEC, the largest supplier of electricity in Israel. Enersize signed two significant new deals during H2/2017: one with Chinese Venergy and one with Scania in Sweden. Nuuka finished its first major delivery project to a major US Fortune 500 customer in New Jersey. *Please note: The result is negatively affected by partial writedown in Oricane (-189k), SavoSolar (-100k) and Lumeron (-78k). It has been a remarkable year. A fun year and not one without challenges. During the year a number of our companies have successfully proven their business cases on global markets and we have had bigger roles than ever before in some of them. We increased our ownerships significantly in several high performers and we took a number of steps towards the clearly stated goal of becoming a company group that saves natural resources. This transition will see us active in five global mega-markets: manufacturing, food, real estate, water and renewable energy. The increase in combined revenues of 77% compared to last year is extremely impressive on any yard-stick, despite the fact that compared to the first half year a delay in one of Nocar’ts projects has caused a portion of their revenues to be shifted forward. As you will see from the overview of their performance, several of our companies are showing impressive revenue growth, mostly on international markets. You may not always see it but the work of growing companies from ideas to successful commercialisation is in reality full of grind and small, small victories along the way. We have been putting out a lot of fires this year, including hiring and firing people in our companies and rescuing funding rounds that would have meant make or break for the companies involved, but we have also managed to help our companies grow successfully even through some tough periods and we have ourselves already made a lot of progress on our new strategy. I am very happy with our efforts and the results we have achieved this year. Allow me to tell you a bit more about it! When looking at our future returns it is important to note that they are not only linked to the success of our companies, but also to a large extent to the ownership we hold in those companies when they make it big. We have purposefully increased our ownership in several high performing holdings over the last year. We went from 10% to 34% in 2017, and now during 2018 increased our ownership further to 63.4% in power plant efficiency company Eagle Filters (and have an option to go to 80%). We have gone from 8.7% to 15.6% (and are going to approximately 17.8% after current funding round closes) in food saver ResQ Club. We also increased in real estate software company Nuuka, from 34.3% to 47.9% (non-diluted) and if we would use the conversion to equity option in the loan we granted to Nuuka in December Loudspring would become a majority owner in Nuuka. Well, Nuuka’s monthly recurring revenue continued to grow and at the end of 2017 was more than doubled compared to January 2017. Under new management, ResQ Club grew their monthly sales over the platform by 79% during the second half of 2017 while simultaneously decreasing costs. Their year on year growth in monthly orders over the platform is 200%. Eagle Filters’ revenue growth in 2017 was 37% and the current order base is at a record high. It is our outspoken belief that these companies have the potential to become international stars in their respective fields. We owned 3.1% (fully diluted) of Berlin-based EV charging app PlugSurfing before selling it to Fortum in early March. The deal returned the invested capital and yielded approximately 18% annual return on top of it during the time the company was in the Loudspring portfolio. The combined teams and resources of Fortum Charge and Drive and PlugSurfing truly have the potential to eliminate much of the bottle-neck that lies in finding and charging your EV and we are very proud of having been a small part in the journey of what is now 60 000 charging points connected to PlugSurfing. We also made a partial exit in Enersize. The multiple on invested capital was approximately 11,3 (1030% increase in value). The sales were a small part of our holding in the company and our current effective ownership is still 35,6%. Enersize has also closed eight new installation contracts during 2017 but a lot of the current contracts are yet to be installed and payments do not kick in until after one year, so it will take a while before the big order intake shows in their results, but we remain very confident in the potential of Enersize. Their software is becoming smarter as we speak and they are improving their potential to find savings in compressed air systems every day. We will continue to build the company into the global leader in industrial compressed air energy savings. A portfolio of companies provides diversification and as we mention often not every company becomes a success. Two firms that were part of the Loudspring portfolio in the beginning of the year have been sold in a transaction that have resulted in a loss: One1 and Savo-Solar. Both have been challenging growth journeys, to the extent that we had chosen a non-active role the last few years. We have been selling our shares in Savo-Solar over a period of almost two years and sold the remaining few percentages during first half of 2017. In One1, we sold all shares in one sale to the entrepreneurs in the company. The holding may still provide an additional income if the development of the company is positive and that is why we haven’t written One1 down in the balance sheet yet. While these two transactions did not significantly move the needle in terms of cash available on hand, it does free up additional energy when you decide that a company’s challenges are no longer yours. Our strategy over the last three years has been built on how to best accelerate our companies’ growth. We have increasingly focused on providing assistance for internationalization (in case you missed it we have launched offices in Los Angeles, Berlin and Stockholm and helped our companies gain access to the Chinese market through our partners there), getting our companies external growth funding as well as providing it ourselves, and making sure we and our companies communicate and market themselves professionally. After seeing successful results with remarkable portfolio revenue growth over the last three years, we have now embarked on the next step of our own journey, which will over the coming three years turn us into a company group that saves natural resources, active in five global mega-markets. We changed our name to Loudspring to better reflect this, and have a strategy in place that we are already well into implementing. Why are we doing this? With bigger ownerships in selected capital-light companies that we can see from the inside that they are growing well, we get a bigger part of the upside, and with the efforts that go into making early stage start-ups fully-fledged success stories, we believe it makes sense to increase in the ones where we see that it is suitable and where we can get good deals to do so. We are, as you are probably aware, not a fund, but a profit-seeking company and as such will benefit greatly from having a more stable stream of income from future profitable companies alongside the more irregular but bigger income that is derived from exits. And the big five? Well you may have noticed that we have big holdings in real estate, fashion, food, energy and water. These are the industries our core companies are disrupting. Having international presence does add a bit to our cost base, even though we do it as capital effective as possible, but I cannot state enough how important it is in order to provide better support to our companies. Even more so as we increase our ownerships. We have already helped our companies get new international owners as well as customers and distributors and sales agents and it would not have been possible without having more long term presence to build those relations. These efforts will make all the difference also going forward. At the same time, we recognize that we cannot lose hold of our Nordic roots. At this point in time, our retail shareholders are predominantly Finnish and a minority in Sweden. We will seek to increase the number of shareholders we have in Sweden this coming year, and this will be achieved by increasing our presence in Stockholm. We have historically not provided comprehensive company information let alone market guidance to the stock market on the financial outlook of any of our portfolio companies. We have suffered a little from this but we have been apprehensive to pass on such information to the market, as we have been a minority owner, many of the companies have been in different fundraising stages, and valuation negotiations can be affected. Now that we are going to bigger ownerships though, we recognize that this is something that we will need to improve on. In the future, we will therefore announce more comprehensive parameters for portfolio performance that will be kept updated on our web page. The format of this is being determined as I write this and in the meantime we are also having various analyst firms provide their analysis. I am confident that this increased information will be valuable for both current and future shareholders of Loudspring. The solutions our companies provide are being received very well by their respective markets. Technology and customer acceptance risks have largely been removed in our core holdings. Scale-up and growth related risks, however, have not. One part of growing our companies the coming year is to fund the ones who still have funding needs with suitable growth capital, another is to find and add additional talent for international growth to the teams. This will be a focus of ours the coming year and the work has already started. Our first announcements are out on social media, do share and feel free to get in touch if you have Loudspring aspirations yourself. We look forward to a very exiting year where our increased ownership result in accelerated growth and even better packaging and marketing of our firms. We appreciate each and everyone one of you and hope to see you during the year! The value of Loudspring should reflect the value of the portfolio and it is through dividends but more often exits in these companies that the majority of income will be found. In its reporting, Loudspring comments on the development in core holdings. There will also be an attempt for each core holding to reflect on the current dynamics in the industry that this core holding is operating in. Core holdings of the portfolio are firms where the holding size and/or value contribution is significant enough to affect the value of the Loudspring share. For listed firms, we report our effective ownership. Efffective ownership means taking into account our full ownership and the indirect ownership through holding companies and/or via Clean Future Fund. For unlisted firms, we report effective ownership, fully diluted. Those holdings that are part of the venture and incubation portfolio will be commented upon only if significant development or larger funding rounds take place. The comments on either the core holdings or on the venture and incubation portfolio are not an exhaustive description of each of the associated company's situations or their risks. As a minority shareholder of most of its portfolio firms Loudspring is not in a controlling position of its portfolio companies. The portfolio firm achievement descriptions from each reporting period are written by the portfolio firm management and reported to Loudspring management. After Enersize’s IPO in June 2017, we rely on publicly available information on Enersize. A key indicator may also be disclosed that describes the development in the core holding. The combined revenue (estimated, non-audited) of the associated companies was 49,0 MEUR in 2017 (27,7MEUR for 2016). The combined revenue (estimated, non-audited) of associated companies has grown by 77% during 2017. 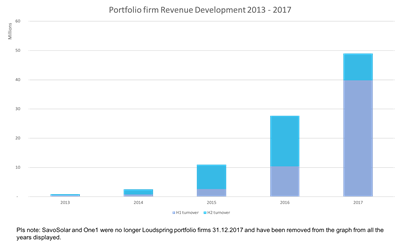 Please note that SavoSolar and One1 were no longer Loudspring portfolio firms 31.12.2017 and are thus not included in the portfolio firm combined revenue number even though Loudspring still had ownership in these two firms during 2017. The combined revenue of the associated companies, that includes audited figures for the core holdings, will be reported separately once audited figures have been received from all core holdings. At the time of reporting, finalized 2017 annual accounts of core holdings are available only on Enersize, Nuuka Solutions and Eagle Filters. For Swap.com, Nocart and ResQ Club and Sofi Filtration, the figures are estimated and reported to Loudspring by the portfolio firm management. Fashion is one of the most resource intensive industries in the world. The global apparel and footwear industries combined account for 8 percent of the world’s greenhouse gas emissions, the majority of which are tied to fiber production, yarn preparation and dyeing and finishing phases. These greenhouse gas emissions are almost equal to the total amount emitted in the EU on an annual basis. By extending the life cycle of clothing through second hand trade, the impacts of fashion on the environment can be reduced significantly. Giving a second life to a piece of clothing is one less item needed to be produced. Despite a general trend towards sustainable consumption, fashion has gravitated towards faster sales cycles and the biggest brands are finding ways to sell clothing cheaper and cheaper. This culture of buy, wear once or twice, and throw away has a highly negative impact on the environment. Swap.com (Swap.com Services Oy) is an online consignment store that solves the challenges related to current ‘brick-and-mortar’ second hand shops, such as providing a large enough selection to consumers. Swap.com has an extensive selection, wide consumer reach, and because it operates using a consignment model, shipping expenses are lower than comparable peer-to-peer sales platforms such as eBay. In H2 / 2017 Swap.com worked on the basic business operational efficiency and marketing efficiency improvements which resulted in all time records in gross margins. A new seller commission model was introduced in August 2017 increasing the commissions for Swap.com from sellers significantly. Demand for selling through Swap.com stayed similar after the change. The company currently needs significant new funding and is aiming to close further funding and scale the business with new gross margins. Real Estate is the pre-eminent global asset class. The smart building market is driven by the fact that buildings are becoming increasingly complex and they are generating vast quantities of data. Most building owners and operators however are not leveraging this data as much as they could. Managing buildings better is a huge opportunity: large part of the world’s energy is consumed by buildings. At the same time as the building managers are faced with ever more complex buildings that need to be run with ultimate operational efficiency, the changes in building use and occupancy can contribute to indoor air-quality problems, uncomfortable environments, and higher overall costs. Also the user of the buildings, especially in major commercial real estate market, are becoming more demanding and are looking for offices and shopping experiences where the buildings behave according to users needs, not only as a static constructions. To counter these issues and turn the equation into an opportunity where a well managed building can charge higher per square meter rents, building owners and operators are taking into use solutions such as provided by Nuuka. The Nuuka platform is hardware-independent, making it extremely flexible and future-proof. The Nuuka platform is also open, with anything and everything able to be connected to it. Nuuka analyzes and optimizes all data it collects in real time and converts it into useful information and insights that when sent to the right user, at the right time, is making buildings smarter, more sustainable and more profitable. The smart building of the future will be defined by functionalities such as immediate adaptability, reduced strain on the grid, and comprehensive learning with real-time response. The companies that understand the holistic user perspective can harness a growing share of the value of the global real estate market and Nuuka’s open platform will be a very competitive solution for the management of the smart building of the future. During the reporting period Nuuka continued to add more important big-name reference customers in Finland, Sweden and Benelux. The monthly recurring revenue continued to grow and at the end of the year grew by 125% when compared to January 2017. Nuuka also finished its first major delivery project to a major US Fortune 500 customer in New Jersey. Nuuka did not move forward with plans to IPO in 2017, as the IPO market sentiment suffered some in late 2017, and the company opted to achieve further growth outside the stock market. If Loudspring would use the conversion to equity option in the loan granted to Nuuka in December 2017 it would become a majority owner in Nuuka. Therefore, Nuuka would become a majority owned business of Loudspring which is a listed stock. In H1/2018 Nuuka is looking to further accelerate its sales and delivery processes and will recruit more experts to help in expanding the solution within its current customers portfolios as well as finding new customers. Although renewables are quickly growing in the world’s energy mix, it will take several decades to phase out fossil fuels and be close to 100% renewable and low-carbon. Natural gas currently supplies approx 22% of the energy used worldwide, and makes up nearly a quarter of electricity generation. As we are transitioning towards a zero-emission world, natural gas is an important complementary energy source to renewables. There are two key reasons for this. First, the CO2 emissions of producing electricity with natural gas is approximately half that of coal; and secondly, gas turbines have flexible load following and have an increasing importance as back-up power to wind and solar resources. Natural gas turbines are commonly operated inefficiently, resulting in unnecessary power losses. Approximately $7.5 BUSD is wasted every year due to air impurities in gas turbines. Air impurities foul compressor blades, which decreases efficiency. Fuel efficiency can deteriorate up to 5% and power output up to 10%, before periodical washing of a turbine. Eagle Filters has developed and patented, as the firm itself refers to as the world’s best performing air filtration solution for gas turbines, which significantly increases the efficiency of gas turbines. With Eagle Filters installed in a turbine, the annual output of turbines can improve up to 6% and fuel efficiency can improve up to 3%. In addition, turbines need to be washed only during annual maintenance, eliminating down time and extending turbine life. Eagle Filter’s product is the most advanced filtration technology on the market and is based on nano-fibres, superior aerodynamics and a patented dual stage construction that enables effective pulse cleaning, durability and reliability. During H2/2017 order intake started to increase. Revenue growth in 2017 reached 37% and order base for Q1/2018 is on a record high level. Loudspring increased its ownership of the company to 63% in the beginning of 2018, with an option to increase further to 80%. A new US subsidiary is under establishment and recruiting of new sales staff is under way. Compressed air is a very common energy bearer in manufacturing plants across the globe and across industry verticals. 90% of all factories use compressed air in some shape or form and it typically amounts to 10-35% of a factory’s electricity cost. The Chinese manufacturing sector is the biggest in the world, with approximately 10% of all electricity use in China is used in compressed air systems. Enersize has focused on China because of this concentration of the world’s manufacturing and the carbon intensity of the energy mix there. The carbon intensity of Chinese electricity is two times higher compared to the EU, and almost ten times higher than in Sweden, making the positive environmental impact significantly higher on that market for Enersize. Enersize’s analytics software manages compressed air systems and provides an attractive proposition that the market is responding favourably to: improve the stability of your compressed air system, save energy costs with no upfront investment and show with proven numbers how you are decreasing your energy use. Enersize software and savings are applicable across industries and customers are now representing industries such as glass, chemicals, cars, screens, and the cement industry. Customers are not only concentrated in China, with Enersize announcing new customers in Sweden and Germany recently. 2017 annual accounts for Enersize are available at http://enersize.com/rapporter . As Enersize revenue does not exceed 1 MEUR, they are not separately reported. Cutting food waste in restaurants and other food outlets at the end of the food chain, when the food has already been grown, transported and prepared to eat has a big impact on the amount of natural resources needed for that meal. The potential market for rescuing perfectly good meals is more than 20 BNEUR in Europe alone and similar in the US, and there is little competition world-wide so far. Delivery services and various digital ordering apps have made big inroads into how food is prepared and delivered over the last years but the food marketplace is still wide open in terms of cutting food waste using digitalization, which is where ResQ fits in, allowing you to find meals that otherwise would go to waste at heavily discounted prices, giving users a possibility to find good quality, inexpensive food and get to know new restaurants at the same time. During the reporting period ResQ had some management changes. Company management was changed in August when Sauli Böhm and Aku-Jaakko Saukkonen were switched to CRO and COO positions. Quite soon after in October Sauli Böhm took the helm as CEO. Under the new management, the company grew monthly sales over the platform by 79% (Jul-17 - Jan-18) and reduced the burn rate by 50%. For the users, product development initiatives included upgraded filtering based on preferences and referral feature. The work is to enable ResQ to cater multiple customer journeys in order to further increase activation and retention rate for non-purchasing users and repurchase rate after the first purchase. For the partner side, development initiatives were mostly focused on upgrading the foundation through refactoring, updating the payment process and releasing enterprise accounts. During the reporting period the company won the Hero Award from a startup competition organised by Delivery Hero. The strategic importance of the prize comes from the mentorship Delivery Hero provides over 2018. The program was kicked off in December (2017). create personalised user experiences at scale on the consumer side. For ResQ partners, the company is planning to introduce a number of new services. The company has set itself a target to become a market leader in the Nordics. Probably every manufactured product or industrial service such as energy generation uses water during some part of the production process. One of the main industrial sectors where Sofi Filtration concentrates is the energy industry, where large volumes of water are currently used. There is growing recognition that saving water saves energy, which saves money. Other water hungry industries with growing environmental awareness where Sofi Filtration focuses are mining and urban infrastructure projects. During the reporting period Sofi Filtration had a focus on its biggest growth market segment at the moment, flue gas wastewater treatment. The company agreed on a pilot with a major client that was carried out in January 2018. Also, the marine flue gas market was studied with promising results from small scale testing. Critical testing has been scheduled for H1/2018. Sofi Filtration also lead a product development project for a new household filter system capable of microfiltration and UV-light bacteria killing as a fully automatic system. Sofi Filtration and Cimbria Capital, based in Houston, Texas, started a collaboration for incorporating Sofi Filtration in the US, and working together on a business plan and investment case for US investors. The company also started discussions with a channel to market partner to reach the construction industry in the Nordics. The Sofi Filter was recognized as one of the most prominent recent water tech innovations and was invited for a stand to high visibility Innovation Pavilion in Weftec, Chicago by Bluetech Research. Weftec is North America's biggest water treatment exhibition. The demand for decentralized renewable energy is growing for various reasons around the world, especially in developing countries. Shortages of available power is leading to unexpected utility power outages and power quality problems, which increases power costs and subsequently interest in using local energy resources and waste feedstock for power generation. Lack of access to reliable electricity also has tremendous social and environmental impacts due to time needed to transport diesel to run inefficient generators in isolated places, as well as poorer educational outcomes due to a lack of light in the home. Energy demand is predicted to go up in Africa, driven by both population and economic growth. Some predictions estimate the global microgrid market to be worth $400 billion. In a report from TFE Consulting titled ‘Kenya: The World’s Microgrid Lab’ the authors estimate that the Kenyan micro-grid market alone could reach 2000 – 3000 microgrids by 2021, up from the 65 microgrids between 5 kW and 100 kW currently operating. It is estimated that by 2050, Africa will be home to at least 2 billion people (a doubling of today’s population) with 40% living in rural areas that depend on microgrids and distributed energy resources. 600 million Africans still have no access to electricity at all, and while 1 billion people in Sub-Saharan Africa are expected to gain electricity access by 2040, an estimated 530 million will still not have electricity access due to population growth. At the same time, it is estimated that Africa's GDP will increase roughly three-fold by 2030 and seven-fold by 2050. To handle both the population growth and the economic growth, a much larger and better-performing energy sector, mainly driven by distributed energy solutions, is needed. Nocart is a player in this huge market. Nocart continues to enjoy considerable demand for its products in several global markets. Projects in East Africa and Zambia are proceeding although the company is experiencing delays to previously advised timelines. Innovative products including the Solar Tree, container-based solar and multifuel systems and gasification processes are being developed and refined ready to be sold in 2018. Interest is being shown in the company’s products in Singapore, UK and Australia, and Nocart expects to make our first sales in these markets in 2018. Nocart also needs additional financing and will concentrate on the development of its operational and organizational capability. The figures below for 2017 are estimated by Nocart management, and have not yet been presented to Nocart board and are non-audited. *Please note: Delay in Nocart’s project in Zambia has affected negatively the estimated H1/2017 revenue figure Nocart management reported in August 2017. Nocart’s share of the H1/2017 revenue was 50,050 kEUR, but as was also mentioned in the H1/2017 release, all revenue figures were non-audited estimates and were based to a significant degree on invoicing where payment had not yet been received. Due to the delay in Zambia project, part of the Nocart 50,050 tEUR H1/2017 revenue has moved forward in time. Those holdings that are part of the venture and incubation portfolio will be commented upon only if significant development or larger funding rounds take place. The comments are not an exhaustive description of each of the associated company's situations or their risks. Serial production of Aurelia’s product officially started. The company closed deals with three marketing partners and one integrator partner. Metgen closed a licensing deal for their lignin valorisation technology, and industrial company Ecolab invested in the company. Oricane has shifted focus on licencing or selling of its patent portfolio. PlugSurfing signed partnerships with Daimler (Smart), grew users by 25% compared to H1 and continued an M&A process aiming to sell 100% of shares of company. 60,000 charging points were accessible with Plugsurfing at year-end, a 50% increase compared to 40,100 previous year. Note! PlugSurfing was acquired by Fortum during the first quarter of 2018. Plugsurfing has over the last three years established itself as Europe’s leading, independent charging service for electric vehicles. A Berlin-based startup, Plugsurfing has been one of the few to successfully take on the challenge of Europe’s fragmented charging networks. At the time of sale the company had a userbase of 50,000 electric vehicle drivers to over 200 charging networks, allowing them to charge at more than 65,000 chargers across 24 European countries. SansOx closed a deal with and delivered the first public sector water works contract in Finland. The company also piloted new technology at a Finnish pulp and paper site, which can possibly lead to a new business area. SansOx continued piloting with possible partners in the Middle East and South-East Asia. In the second half of 2017 Watty scaled up its community of users and made major improvements to its platform. 2018 will be focused on going to market together with utility partners in Europe. The company's revenue in 2017 was 28,833 EUR (1-12/2016: 395,886 EUR). The revenue decrease was due to a smaller number of fee-based financing projects carried out. Materials and services expenses in 2017 were 79,311 EUR (216,414 EUR). The smaller expenses were due to fact that in 2016 the firm carried out a parallel listing to Stockholm First North and used more external services. Personnel costs in 2017 amounted to 453,312 EUR (522,696 EUR). Other operating expenses totalled 621,659 EUR (571,332 EUR). The increase in expenses was mainly due to having pop-offices in two locations: Los Angeles and Stockholm during 2017. Depreciation, amortization and write-downs of intangible and tangible assets in 2017 were a total of 179,264 EUR (170,693 EUR). The company’s operating loss for 2017 was 1 304,715 EUR (1 085,250 EUR). The increase in loss was due mainly to lower revenues from fee-based financing projects than in 2016. Financial income in 2017 was a total of 314,388 EUR (50,217 EUR) and financial expenses were a total of 571,128 EUR (101,331 EUR). Increase in financial income was due to dividend income, interest income from loans, selling some of the Enersize ownership and the remains of SavoSolar shares. Financial expenses included fees paid in connection to share issues and writedowns in three firms, SavoSolar, Oricane and Lumeron. Writedown in SavoSolar amounted to -100k, writedown in Oricane to -189k and in Lumeron -78k. The writedown in Oricane represents approximately 50% of the previous value of the firm and is due to a more conservative expectation of the future value of the firm. The net loss of the year 2017 was 1,562,277 EUR (1,136,957 EUR). In February 2017, a directed share issue with a size of 2,6 MEUR was carried out. In the offering, 933,000 new class A shares were offered at the subscription price of EUR 2.74 per share. The reason for the offering was to accelerate growth in our current portfolio and potentially investing in new early stage companies. In October 2017, a share swap was carried out with certain founders of Nuuka Solutions Oy. In the offering, 143,100 new class A shares were issued and the company received a total of 477 class A shares of Nuuka Solutions Oy. The reason for the offering was to increase ownership in Nuuka Solutions and transition it to the status of a ’core portfolio company’. In November 2017, a directed share issue of 1,2 MEUR was carried out. In the offering, 442,250 new class A shares were offered at the subscription price of EUR 2.64 per share. The reason for the offering was that the company wanted to have the capability to pursue opportunities that were currently available and that the company believed were beneficial for the shareholders to pursue. In December 2017, a directed share issue with a size of 1,3 MEUR was carried out. In the offering, 475,977 new class A shares were offered at the subscription price of EUR 2.64 (SEK 26.26) per share. The reason for the offering was to raise capital in a time and cost-effective manner while broadening the institutional shareholder base. The balance sheet value of the investments amounted to approximately 20,0 MEUR. During 2017 the two biggest investments were made in Swap.com and ResQ Club. Enersize was in the balance sheet revalued lower by 1,48 MEUR, Oricane by 0,19 MEUR and Lumeron by 0.08 MEUR. ResQ Club: In May 2017 ResQ Club and their German competitor MealSaver where merged. The resulting company carried out a financing round where Loudspring participated. Louspring ownership in ResQ Club increased from 8.7% to 9.5% after the investment round and after the acquisition. In August 2017 a financing round was carried out among existing ResQ Club shareholders. Loudspring ownership increased to 15.6% (fully diluted). Several other current owners also participated in the financing round. Enersize Oyj: In May 2017 Enersize succesfully raised approximately 2,9 MEUR in a share issue before listing its shares on First North Stockholm. The share issue was fully subscribed and added 700 new shareholders to Enersize. Loudspring ownership in Enersize was 37,7% after the share issue. Loudspring made a partial exit in Enersize during Q3/18. The multiple on invested capital was approximately 11,3 (1030% increase in value). The sales represented 2,3% of the company. After share sales Loudspring effective ownership was 35,6%. Nuuka Solutions Oy: In January 2017 Loudspring participated with several other investors in a financing round in Nuuka. The effective ownership was 34.3% after this investment round. In October 2017 Loudspring made a share swap agreement with four Nuuka shareholders. After the share swap, the effective ownership of Loudspring in Nuuka increased to 47,9% (46,8% fully diluted). Payment of the Nuuka shares was done through issuing a total of 143,100 new class A shares in Loudspring. Nuuka Solutions was made an investment through a capital loan in December 2017. The loan includes a right to convert the loan into equity earliest in March 2018. If the conversion right, including accrued interest was taken into account, Loudspring would become a majority owner in Nuuka. However, this conversion right was not available at the end of the reporting period. PlugSurfing GmBh: In February 2017 Loudspring participated in a funding round with other PlugSurfing shareholders. Loudspring ownership in Plugsurfing after the round was 3,1%, fully diluted. In March 2018 PlugSurfing was acquired by Fortum Charge & Drive. Sofi Filtration: In May 2017 Loudspring participated in a funding round with other Sofi shareholders to enable expansion outside of Nordic markets. Loudspring ownership in Sofi after the round was 25,2% (fully diluted). Eagle Filters: in March 2017 Loudspring executed a follow-on investment into portfolio company Eagle Filters. The ownership increased from 10 to 28%. In addition, Loudspring secured options to potentially increase ownership to 40%. In December 2017 Loudspring exercised a part of its options in Eagle Filters, and increased ownership from 28% to 34%. Alexander ‘Bigge’ Lidgren acted as the Managing Director of the company during the financial period. In addition to the managing director, the company employed 4 staff (Tarja Teppo, Lassi Noponen, Timo Linnainmaa and Joshua Burguete-Kirkman) who together formed the management of the company. In the beginning of the financial period the board of directors consisted of Lassi Noponen (Executive Chairman), James Penney, Peter Carlsson, Thomas Bengtsson and Matti Vuoria. On the 21stof April 2017 Gudrun Giddings came on as a new board member. Since the 21stof April 2017 the board of directors of the company consisted of Lassi Noponen (Executive Chairman), Thomas Bengtsson, James Penney, Peter Carlsson, Matti Vuoria and Gudrun Giddings. General risks concerning the business environment of Loudspring are related to recent macroeconomic and capital market uncertainty. The associate companies of Loudspring are start-up and growth companies, and there are remarkable risks involved both in their business operations and through investments in them. It is uncertain that Loudspring is able to sell its holdings in associate companies in a profitable way or that the sale is possible in a planned schedule in line with the company’s strategy. Due to the nature of Loudspring's business environment, success in collecting finance for the associate companies’ operations is of utmost importance. As Loudspring is currently minority shareholder in the vast majority of its associate companies, Loudspring has only limited ability to influence decision-making in such companies. Loudspring is also highly dependant on information that it receives from its associate companies’ management. The risks related to the company’s business have been described in detail in the listing prospectus dated 2 May 2014, which can be found (in Finnish language only) on the company’s website, available at bit.ly/cti-listautumisesite . The investor memorandum for First North Stockholm listing dated February 2016 contains an overview of the risks related to the company’s business (in Swedish language only). The investor memorandum can be accessed via the company’s website at bit.ly/cti-memo . An update to the memorandum was made in September 2016 which can be found at company website at bit.ly/cti-description-supplement . There are no major changes in the risks and uncertainties since the date of Stockholm listing prospectus. However, the financial position of Loudspring has improved based on the directed share issue that took place late 2017. The outlook for certain associate companies has brightened when they have succeeded in gathering financing and acquiring new customers, thereby sharing the revenue risk. On the other hand, some of the associate companies have not reached their targets as to financing, operations and customers and it should be noted that several rely on successful funding rounds in the near future. From the very beginning, diversification was one of our key differentiators from the rest. An investment in us was an investment in many resource and energy efficiency companies. During the turbulent recent past on the stock market diversification has proven to be truly valuable and we continue to embrace it in the future. Our goal is to always provide our shareholders with a diversified portfolio of the most interesting Nordic energy and resource efficiency growth companies in different stages of development. We have core companies that we will continue to invest in and grow for the long term and we have a venture arm which we will grow and seek partial exits from in the short to medium term. We will focus primarily on the ‘hands on’ acceleration of our core companies, where we have the largest ownership and influence. Acceleration means hands on work and making sure they have the right tools and resources to grow. While the majority of our focus will be on our core holdings, we maintain an appetite for deal flow. There are still so many great businesses that are on the same mission as Loudspring and we look forward to meeting them. Our shareholders are not passive and they want more tangible information about the performance, impact outlook of our individual portfolio companies and we recognize that we can do better. As we will strategically invest more of our time and resources into a core group of companies, for these we will be providing regular analyses of their business activities, more detailed communication about their business fundamentals, performance and financial outlook. The Nordic area is still a growth engine of the world for companies that save natural resources. Loudspring plans to consolidate its presence in Helsinki and Stockholm to create critical mass and synergies. We have established a permanent base in California that will continue to help our companies grow in the North American market. Our Nordic identity is the bedrock of our strategy. This means that strengthening this part of our identity will continue to be a priority. Bringing more Nordic partners and stakeholders on the journey with us continues to be a priority. Markets are more nervous but resource efficiency is not a passing trend. It will always be a priority as we recognize our impacts and the importance of the environment. A new political style of took hold on the federal level in the US, but the US maintained leadership through the actions of the states and mayors instead of the federal legislators. Political risk proved not to be as fierce as we all might have thought. New political actors rose-up and filled the void, and the planet still has a fighting chance. Forward looking business and consumers around the world continue to be an ever more important driver in the transition to sustainable economy. There are signs of emerging new industries, such as reducing food waste, where ResQ Club is a leader, and we expect new stars to rise. We aim to play a large role in this industry transformation and capitalize on this according to our strategy. We also look forward to positive developments from some of our firms, especially our core businesses Eagle Filters and Nuuka to mention a few, and overall we expect strong growth to continue. We also know from experience that not all companies will succeed in their business development and fund raising efforts and may have negative developments. We have noticed an underlying shift in the relationships between the individual portfolio companies and the investors they interact with. In many ways the standard venture funding model is being turned upside down, where the traditional funding round and roadshow are no longer the most viable methods of financing venture growth. It is ever increasingly the job of the entrepreneur to partake in a continuous roadshow where they are constantly interacting with different classes of financing partners; banks, venture funds, equity offices, family offices, angels, and so on. This requires that entrepreurs are competent on a large array of financing instruments. Overall we expect 2018 to be a good year for Loudspring and we’ll focus on our core companies. During the year we expect to start providing market guidance on the performance of our majority owned businesses. In selected companies where we see a near term opportunity for high profitability, we will seek majority ownerships. The goal is to secure a recurring and growing dividend stream from these selected businesses. Aim for profitable growth is at the core of our future strategy. We look forward to partial exits from our non-core portfolio companies during the coming year. We will also continue to evaluate all possibilities for value creation as we have announced earlier in our strategy update. The Annual General Meeting of Loudspring Plc (that time called Cleantech Invest Plc) was held on the 21stof April 2017 in Helsinki. The Annual General Meeting adopted the annual accounts for 2016 and resolved that the net loss of EUR 1,136,957.05 be transferred to retained earnings / loss account and that no dividend be paid. The Annual General Meeting discharged the members of the Board of Directors and the CEO from liability for the year 2016. The Annual General Meeting resolved that the members of the Board of Directors be paid EUR 400 per month and granted additionally 10,000 stock options as annual remuneration. The stock options shall be issued based on the authorization granted by the Annual General Meeting. The remuneration of the members of the Board of Directors is not paid to persons working for the company. The members of the Board of Directors are reimbursed for reasonable travel and lodging costs. Travel and lodging costs will not be compensated to those members of the Board of Directors who reside in the greater Helsinki area when the meetings are held in the greater Helsinki area. The Annual General Meeting resolved that six (6) members be elected to the Board of Directors. The Annual General Meeting re-elected the current members of the Board of Directors Mr. Thomas Bengtsson, Mr. Peter Carlsson, Mr. Lassi Noponen, Mr. James Penney and Mr. Matti Vuoria as members to the Board of Directors and elected Mrs. Gudrun Giddings as a new member to the Board of Directors. The Annual General Meeting resolved that the auditor’s fees are paid according to the auditor’s invoice approved by the company. The Annual General Meeting re-elected Deloitte & Touche Oy, Authorized Public Accountants as the company’s auditor. Deloitte & Touche Oy has informed that the principal auditor will be Mr. Aleksi Martamo, Authorised Public Accountant. Three main authorizations were given: 1) authorizing the board of directors to decide on issuance of shares, 2) authorizing the board of directors to decide on issuance of options and 3) authorizing the board of directors to decide on acquisition of the company’s own shares. The AGM decisions are available in detail on the company website at http://loudspring.earth/news/category/1/resolutions-of-cleantech-invest-plcs-annual-general-meeting-and-board-of-di . At the beginning of the financial period the company had a total of 21,950,990 shares, divided into 4,569,031 class K shares and 17,381,959 class A shares. Class A shares each have one vote at shareholders’ meetings and class K shares each have 20 votes at shareholders’ meetings. On 3 February 2017, the Board of Directors of the company resolved on a directed share issue where a total of 933,000 new class A shares were subscribed at the subscription price of EUR 2.74 per share, which equalled to the volume weighted average price of the company’s class A share on First North Finland during the time period between 23 January 2017 and 1 February 2017 with a discount of 10%. The new shares represented approximately 4,1% of the outstanding shares in the company after the share issue. The new shares were registered with the Trade Register on 16 February 2017 and after the registration there were 4,569,031 class K shares and 18,314,959 class A shares in the company. On 27 October 2017, the Board of Directors of the company resolved on a share swap arrangement with certain founders of Nuuka Solutions Oy. The company issued a total of 143,100 new class A shares and received a total of 477 class A shares of Nuuka Solutions Oy as consideration. The new shares were registered with the Trade Register on 21 December 2017. On 1 November 2017, the Board of Directors of the company resolved on a directed share issue where a total of 442,250 new class A shares were subscribed at the subscription price of EUR 2.64 per share, which equalled to the volume weighted average price of the company’s class A share on First North Finland during the time period between 19 October 2017 and 31 October 2017 with a discount of 5%. The new shares represented approximately 1,9% of the outstanding shares in the company after the share issue. The new shares were registered with the Trade Register on 22 November 2017 and after the registration there were 4,569,031 class K shares and 18,757,209 class A shares in the company. On 15 December 2017, the Board of Directors of the company resolved on a directed share issue where a total of 475,977 new class A shares were subscribed at the subscription price EUR 2.64 (SEK 26.26) per share, which was determined based on subscription offers received from selected institutional investors. The new shares represented approximately 2 % of the outstanding shares in the company after the share issue. The new shares, together with the shares issued in connection with the Nuuka Solutions Oy share swap referred to above, were registered with the Trade Register on 21 December 2017 and after the registration there were 4,569,031 class K shares and 19,376,286 class A shares in the company. Accordingly, at the end of the financial period 2017 the company had a total of 23,945,317 shares, divided into 4,569,031 class K shares, each having 20 votes at shareholders’ meetings, and 19,376,286 class A shares, each having one vote at shareholders’ meetings. In addition, the company has issued stock options based on which a maximum of 2,293,936 class K and a maximum of 846,000 class A shares may be subscribed. Taking into account the dilution effect of the said stock options, the fully-diluted number of shares amount to 27,085,253, divided into 6,862,967 class K shares and 20,222,286 class A shares. (31 Dec 2016: 25,244,926). Emission adjusted average number of shares was 22,931,538 on 31 December 2017 (31 Dec 2016: 20,868,919). Taking into account the dilution effect of the stock options the emission adjusted average number of shares was 26,054,807 on 31 December 2017 (31 Dec 2016: 24,033,688). The Board members and the management team of Loudspring owned on 31 December 2017 in total 3,344,072 K class shares, 941,203 A class shares, 1,854,028 stock options belonging to the stock option program 2013 that entitle their holders to subscribe for 1,854,028 K class shares and 830,000 stock options belonging to the stock option program 2/2016 that entitle their holders to subscribe for 830,000 A class shares, when taking into account all shares and stock options that the persons own directly or indirectly through companies controlled or influenced by them or through their family members. Additional 16,000 stock options belonging to the stock option program 2/2016 that entitle their holders to subscribe for 16,000 A class shares are held with other people working for the company. The shares owned by the Board members and the management team represent approximately 17,9% of the company's all outstanding shares on 31 December 2017 and 61,2% of the voting rights of the shares. Loudspring had all together 3827 Euroclear Finland registered shareholders according to the shares register on 29 December 2017. 1965 shareholders were registered in Euroclear Sweden. The number of class A shares, which are traded on First North, at the end of the financial period was 19,376,286 and the market cap on 29 December 2017 was EUR 49.4 million. When taking into account also the class K shares, which are not subject to multilateral trading, the market cap was EUR 61.1 million. Closing price of the company’s class A share on 31 December 2017 was 2,55 € per share on First North Finland. During the financial period the highest price paid for the company’s class A share on First North Finland was 3,71€, the lowest 1,61€, and the volume-weighted average 2,79€ per share. The company has a liquidity provision agreement with Pareto Securities that fulfils Nasdaq Stockholm AB’s Liquidity Providing (LP) requirements. Loudspring’s shares traded on First North Finland are not covered by the liquidity provision agreement. Based on the authorization granted by the shareholders’ unanimous resolution on 10 May 2013, the Board of Directors of the company has on 10 May 2013 resolved on a stock option program for the key employees under which a maximum 2,493,936 new K shares can be subscribed. The share subscription period of the stock option program 2013 ends on 31 December 2020. The subscription price is EUR 0.0001 per share. Based on the authorization granted by the Extraordinary General Meeting on 9 March 2016, the Board of Directors has on 10 June 2016 decided on a stock option program for the key employees, under which a maximum 1,000,000 new class A shares can be subscribed. 333,333 of these stock options have been marked as 2-2016A, 333,333 as 2-2016B and 333,334 as 2-2016C. The share subscription period with 2-2016A stock options is 1 July 2016 – 31 December 2025, with 2-2016B stock options 1 July 2017 – 31 December 2025 and for with 2-2016C stock options 1 July 2018 – 31 December 2025. On 20 April 2016, the Annual General Meeting resolved that the members of the Board of Directors that are not working for the company be granted 10,000 stock options as annual remuneration. Following members of the Board of Directors received stock options: Mr. Thomas Bengtsson, Mr. Peter Carlsson, Mr. James Penney and Mr. Matti Vuoria. In January 2017, the Board of Directors of the company allocated 806,000 stock options belonging to the stock option program 2-2016 to key personnel of the company. The stock options were allocated to the members of the company’s management team as follows: Managing Director Alexander Lidgren 400,000 stock options, Lassi Noponen 200,000 stock options, Tarja Teppo 100,000 stock options, Timo Linnainmaa 100,000 stock options and Joshua Kirkman 6,000 stock options. The share subscription period shall not begin for stock option 2-2016A prior to the trade volume weighted average quotation of the company’s class A share on First North Finland has been not less than EUR 1.75 during four (4) consecutive weeks, for stock option 2-2016B prior to the trade volume weighted average quotation of the company’s class A share on First North Finland has been not less than EUR 2.25 during four (4) consecutive weeks, and for stock option 2-2016C prior to the trade volume weighted average quotation of the company’s class A share on First North Finland has been not less than EUR 3.00 during four (4) consecutive weeks. The share subscription price based on these options is EUR 1.00 per share. The subscription price will be recorded into unrestricted equity fund of the company. PlugSurfing was fully acquired by Fortum in March 2018. Both parties agreed not to disclose the contract value. Loudspring owned 3.1% of PlugSurfing before the sale returned the invested capital and yielded approximately 18% annual return on top of it during the time the company was in the Loudspring portfolio. Nocart project and receivables status was given in March 2018. Nocart CEO Vesa Korhonen informed that the Zambia project has experienced some delays and there will likely be a deviation from the originally outlined schedule. Nocart also announced that the previously communicated 14MUSD 10MW solar power plant project in Kenya has started and is progressing according to the forecast. Eagle Filters investment and share swap was announced in January 2018. Loudspring acquired a majority stake in Eagle Filters. After the transaction Loudspring owned 63.4% of Eagle Filters, up from 34%. Agreements have been made with Eagle Filters and its current owners giving Loudspring the option to increase its ownership further up to 80%. Eagle has also been given a loan guarantee of 151k EUR. Nuuka Solutions was made an investment through a capital loan in December 2017. The loan includes a right to convert the loan into equity earliest in March 2018. If the conversion right, including accrued interest was taken into account, Loudspring would become a majority owner in Nuuka. However, this conversion right was not available at the end of the reporting period. ResQ Club investment round was lead by Loudspring in January 2018. The round remains still open but assuming the round is fully subscribed Loudspring stake in ResQ will increase from 15.6% to 17.8%. The 2017 annual accounts with management report and the auditor’s report are available on the company’s website at available at loudspring.earth/share/general-meetings . The Annual General Meeting will be held on the 20thof April 2018 in Helsinki. The invitation to the General Meeting will be published on the 29thof March 2018. The Board of Directors proposes to the Annual General Meeting that the result be transferred to retained earnings / loss account and that no dividend be paid. The half-year report for the period 1 January – 30 June 2018 will be published on 31stof August 2018. Q1 summary for the period 1 January – 31 March 2018 will be published on 20thof April and Q3 summary for the period 1 July – 30 September 2018 on 31stof October. Annual accounts have been prepared following generally accepted accounting principles and applicable laws. The figures of the financial statement release have been audited and they are rounded from exact figures. The comparison figures in 2016 have been given in the brackets unless otherwise stated.